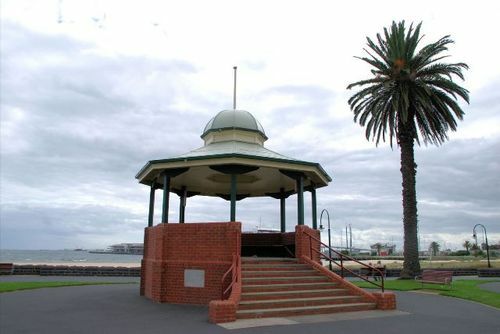 The Port Melbourne Band Rotunda built in 1918 was presented to the council by the Port Melbourne Women`s Welcome Home Committee in honour of the Australians who fought in World War One. The committee met the cost of construction from their own subscriptions. The location of the rotunda is particularly poignant as Port Melbourne was the point of embarkation and disembarkation for troops during the war. The band rotunda erected by the Womens Welcome Committee on the beach at Port Melbourne in memory of Australian Soldiers will be opened at 3 o clock tomorrow afternoon.The Port Melbourne Citizens Band will be present. Addresses will be delivered by the mayor (Councillor R H Gill), Messers Mathews M.H.R and J Murphy. A collection will be made for the hospital. The cost of erecting the rotunda was by the members of the committee. Argus (Melbourne), 26 October 1918.